Like Brotherhood of the Wolf, On Guard is a modern, French, big-budget action movie. In spite of a brief, stomach-turning, only-in-France romance, On Guard is a lot of fun. 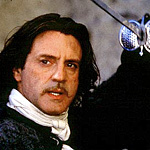 Daniel Auteuil stars as LeGardere, an accomplished swordsman in 18th century France hired to protect the Duke of Nevers (Vincent Perez). On his wedding day, the duke and his wedding party are killed by thugs, hired by his scheming, ambitious cousin Gonzague (Fabrice Luchini). The only survivors are LeGardere and the duke’s infant daughter, Aurore (played as an adult by Marie Gillain). LeGardere joins a traveling theatrical troupe and raises Aurore as his own. Many years later, when the troupe travels to Paris, LeGardere sees a chance to get revenge on Aurore’s behalf. There are plenty of reasons to see On Guard. For one, it is a load of swashbuckling fun. For another, it’s good to see someone other than Americans or Chinese making big action movies. On Guard is not just for the artsy foreign-film crowd (although the fact On Guard is French may allow them to enjoy some action), nor is it just for the hard-core action crowd (although they can appreciate it too). It is for anyone who can appreciate a good, modern, old-fashioned yarn.